WORLD PREMIERE!! 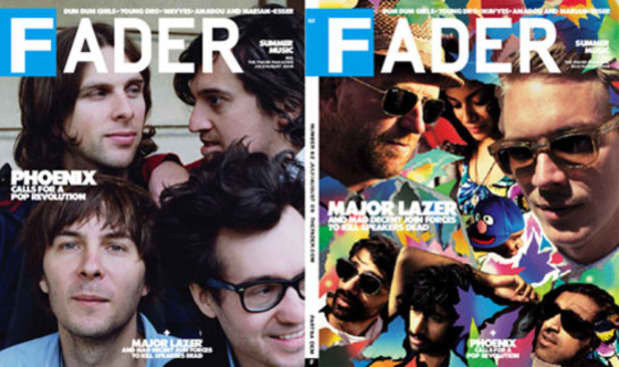 FADER #62, our Summer Music issue, hits newsstands next week and these are the covers. But this week might be the end of us. We're seeing our latest coverstars Major Lazer at least three times and Phoenix hopefully twice. We're going to remix the entirety of Guns Don't Kill People Lazers Do on this new Major Lazer iDrum app and then drink some French wine with the Phoenix guys, or at least some kids who work at APC or maybe just by ourselves. We're going to hand out copies of our new issue like we're the rich uncle at the wedding and they are $20 bills and then we're going to pass out on Sunday and start making the next one on Monday (Jokes! We're already working on it.) So if you see us on the town before then, rambling and not smelling very good, just grab a copy and move along. We'll take showers next week, we promise.